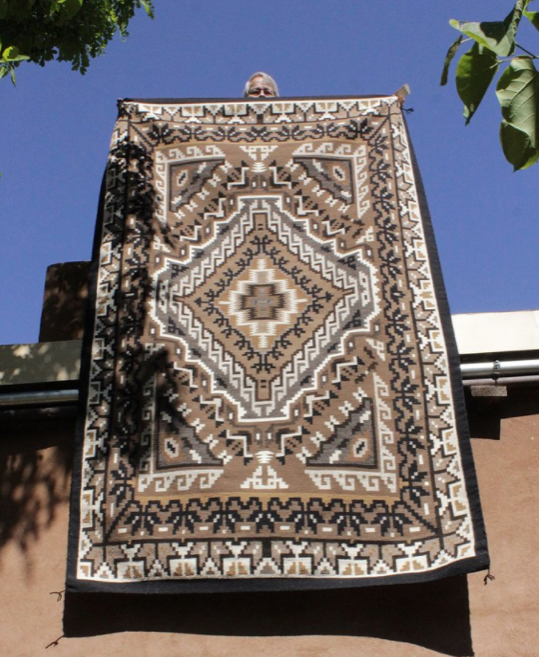 This remarkable Navajo textile was hand-woven of wool in natural white, brown and grey and aniline-dye black wool by Shirley Brown in 2013. She is one of the few Two Grey Hill weavers who will occasionally create work of this size. It measures approximately 6 feet 2 inches by 10 feet 4 inches. The pattern is one of the earliest regional styles to develop (early 1920s) having been encourage by Ed Davies, an Englishman who ran the post at Two Grey Hills (the Navajo name for the spot is Bis Dah Klitso or Yellow Hill) Davies (shortly followed by the trader, George Bloomfield, at nearby Toadlena Trading Post) sought to create a style that was unlike those offered by competing posts and helped give rise to the development of regional styles.